Brought to you with my joint partner LivelyScans. Chapter 27.5 comes in both JPG and PNG. Can you notice a difference between the two? If so, comment and tell me your preference. Yes, Aphorism chapters ARE this short. We are looking for experienced cleaners to help us release (even) faster. 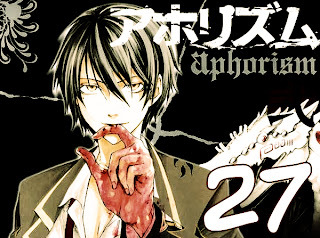 Aphorism ch 28 might take a while because I can only find Chinese raws for it and I can't translate Chinese (I wish I could). Next will hopefully be Aku no Meshitsukai ch 2 and 3 Level Combination ch 12.
try tilting your screen, and look around the text. Normally I would prefer JPG due to accessibility of my viewing program but PNG is okay too. Btw, thank you very much for new chaps. Alright, I've decided on jpg from now on anyways. Thanks for commenting. It's really subtle, but to me the JPG looks slightly crisper and cleaner. To be honest though, I don't think it makes that much of a difference. If you planned to print these or make them huge then it might matter, but I would just stick with whichever your most comfortable with. That's interesting, I thought PNG was better with manga, but I've decided to stick with jpeg. Thanks for commenting. new chapter again! =D thank you so much. this is why I prefer png, makes my work easier, no need to erase the bg or cropping it.